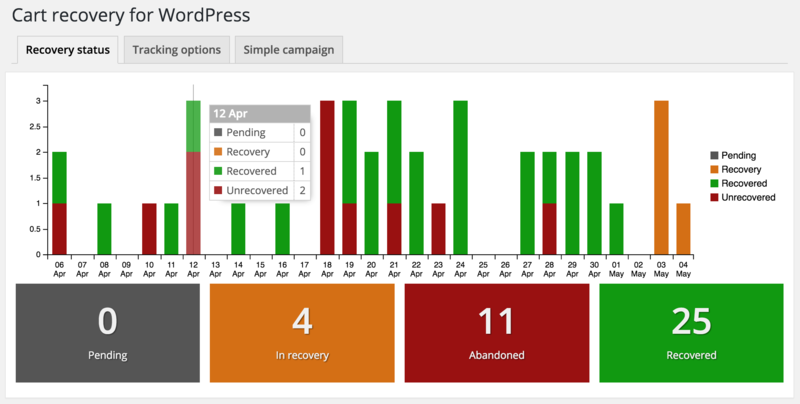 This guide will take you through setting up an abandoned cart recovery campaign with Easy Digital Downloads and the Cart Recovery for WordPress plugin. This is a great plugin to try out abandoned cart recovery, letting you set up an automated recovery email in just a few minutes. The plugin is available from the WordPress.org plugin repository – or you can grab a copy and register for updates on this site. Just install, and activate the plugin as you would any other WordPress plugin. 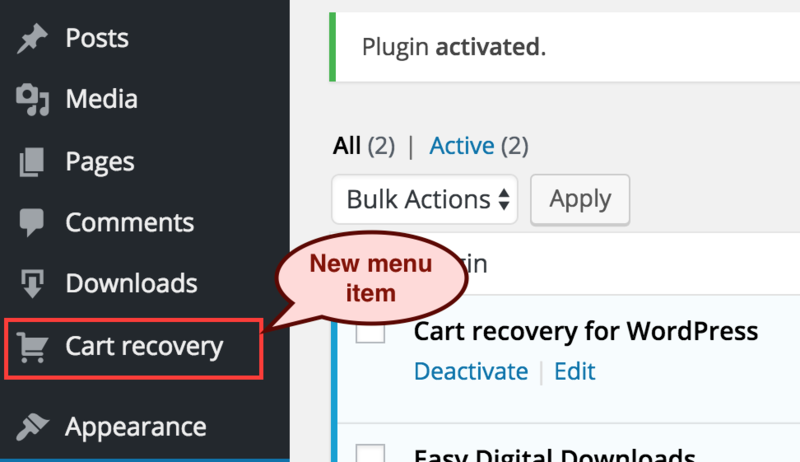 Once you’ve activated it, you’ll see a new top-level menu item called “Cart Recovery” in your WordPress admin dashboard. 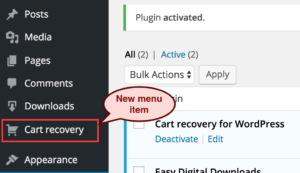 This is where you can modify the settings (on the Tracking options tab), change your recovery email content (on the Simple campaign tab), and also track carts that are being abandoned, recovered and abandoned on the Recovery status tab. To set up the plugin, you’ll first want to check the Tracking options tab. Here you can set the “From address” and name that will be used for the emails that go out. These will auto-populate from WordPress’ core settings, so should be correct – although you may want to have recovery emails go from a specific account. Also on this page there is a checkbox to enable tracking, and campaign emails. You won’t be able to turn this on until your store has processed an order and the plugin has verified that it can track everything it needs from Easy Digital Downloads. We’ll come back to this later. The Simple campaign tab is where you can set up the email content for your campaign. 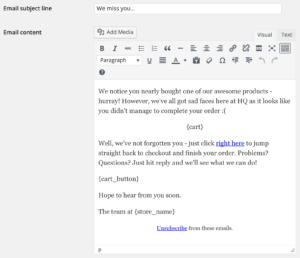 You can choose the subject line, and the email content. Again, default content is provided for your abandoned cart campaign – however you’re free to change it however you want. 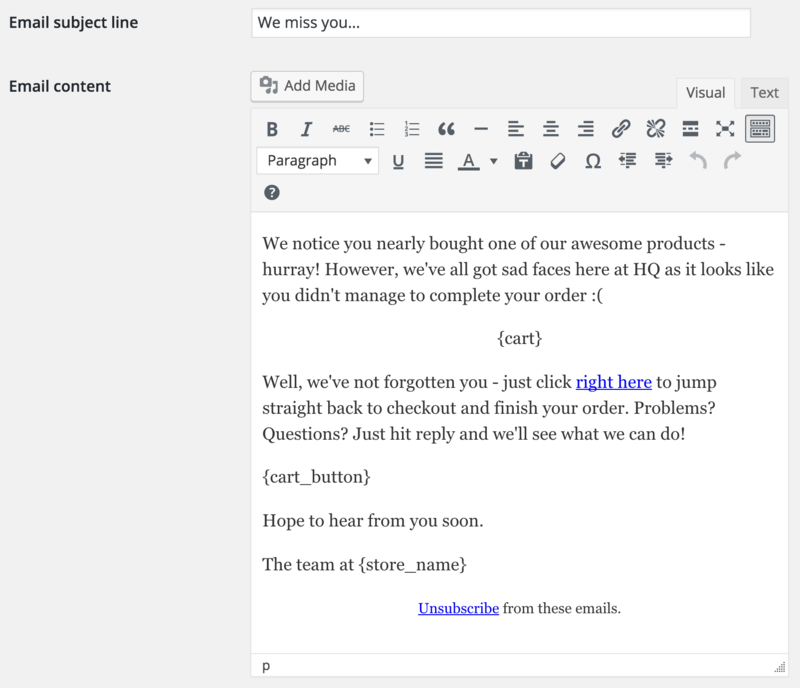 There are a number of email replacement tags that can be used to insert customer-specific information into the email. The sample content includes most of them already – but a handle list is available on the page. Now that you’ve configured your emails you just need to activate your campaign. The plugin won’t let you activate until it’s seen a completed order go through Easy Digital Downloads. You can either place a test order yourself, or wait for a real order to go through. Once that’s happened, then the checkbox on the Tracking options tab will be available, simply check it, and save and your campaign will be active. 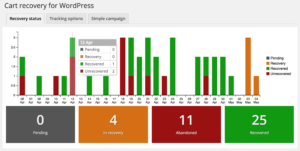 Once your campaign is active, the plugin will start tracking carts, and checkouts in Easy Digital Downloads – you can monitor the process on the Recovery status tab. This will show you a breakdown of how many carts didn’t convert, how many did, and how many are currently going through the recovery process. If you want more detail on the customers, and their carts, then Cart Recovery for WordPress Pro gives you a list of all carts, and their contents, including the ability to export to CSV. It’ll also give you auto-generated, per-customer discount codes, multiple emails, and flexible campaign timing.